Dale Lewis is one of three Jerwood Painting Fellows currently exhibiting work at Jerwood Space, London. 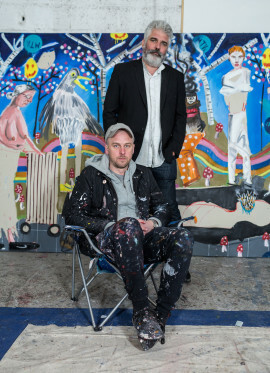 He talks to Fisun Guner about working with mentor Dan Coombs, his mind-crushing experience as an artist’s assistant, and what inspires his open, chaotic and darkly humorous paintings. 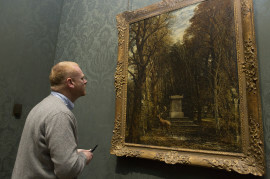 Best known for his paintings using Humbrol enamel, George Shaw’s new show is the culmination of a two-year residency at the National Gallery. Fisun Guner finds out how he has responded to the gallery’s collection and gets some tips on how to rejuvenate the Turner Prize. 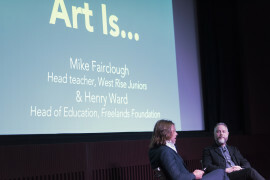 At the recent Art Is… event at Tate Modern, the Freelands Foundation gathered together a cast of artists, educators, gallery directors and more to present a series of talks and discussions about the idea of socially useful art, the importance of art education, and the role of creative freedom for artists. Fisun Guner reports. 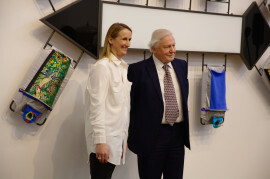 The newly opened £1.5 million wing of the Attenborough Arts Centre creates the largest contemporary art gallery in Leicester, with a current show by Lucy and Jorge Orta that reflects the art and science theme of the centre’s curatorial programme. Fisun Guner reports.